Writer/Director Mateo Marquez’ short film, THE INVADERS, makes its Canadian premier at Fantasia 2018 with a powerful message that hits close to home. 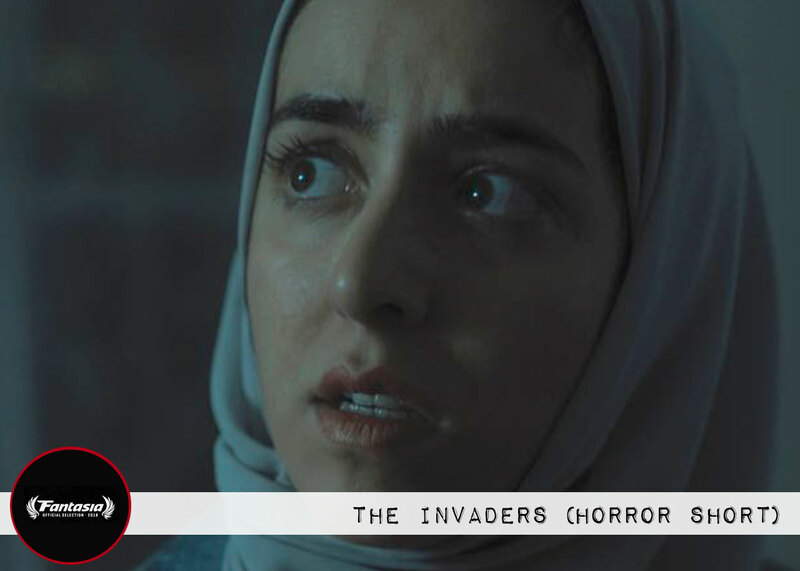 A tightly wound, quickly-paced thriller dealing with Islamaphobia, THE INVADERS is the kind of film that is relevant to today’s ongoing political and racial atmosphere in the USA and the world. Jayla, a Muslim woman, is walking through a neighborhood that could be any middle-class neighborhood in America. As she walks, her pace quickens, and she looks over her shoulder. Jayla is being followed by someone or something. She runs until she reaches what she hopes is the safety of her home. Inside her house, she telephones her mother, asking for help: They are coming. In this thriller, “they” could be anyone or anything. But the fear Jayla feels, and the terror of not being safe in her neighborhood or home, is a subject reflected more and more on social media. It seems every day there is a new video of a person of color being harassed by a white person who declares, “You are not wanted in this neighborhood,” — or that pool, or even selling water on a sidewalk. Muslims, or anyone wearing religious headdress, are shouted down and accused of being terrorists, while being stalked by increasingly threatening white people. Art has a way of shining a light on important social issues, especially movies in the horror/thriller genre. Possibly the most famous is George A. Romero’s NIGHT OF THE LIVING DEAD, which brings light to issues of racism and fear of “the other.” It’s the horror/thriller genre that is uniquely able to add social commentary to a storyline that reverberates with an audience. THE INVADERS is no different, shining a glaring spotlight on the ongoing harassment and bigotry against Muslims. Depending on your point of view, the title could be referring to what is chasing Jayla or Jayla herself. In light of the heated rhetoric of today’s politics, more stories like THE INVADERS are needed and should be required viewing by as many people as possible. It is through the lens of film and art that we get a view into parts of society we may not otherwise have exposure to. THE INVADERS premiered at Fantasia Fest on Wednesday, July 25th.